MUSIKMESSE 2016: Radial Engineering's line of switching solutions is quite, quite dizzying, but that hasn't stopped the company adding to its well-established Tonebone range with two new line selectors: the Headlight guitar amp selector and Bumper compact instrument selector. 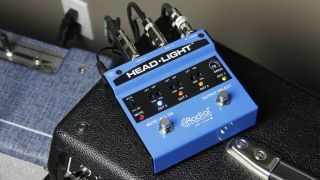 The Headlight gives guitarists the ability to sequentially activate up to four amps using a single footswitch, while a second footswitch mutes the signal for silent tuning or instrument changes - it can also be used to turn all four amps on at once. Building on the Tonebone legacy, the Headlight packs Radial's Class-A buffer circuit, as well as Drag control load correction to maintain the instrument's natural tone; each output promises to be hum-free, too, with switchable ground lifts. Radial's Tonebone Headlight is available soon for $169.99, and can be powered by any standard 9V power supply. Need to run four instruments into a single amp but lacking in pedalboard real estate? The Bumper is the answer, with a single footswitch for cycling between instruments. Like the Headlight, the Bumper offers Radial's Class-A buffer circuit and Drag control load correction, but also features a buffered tuner output, volume trim pots and trim switches to adjust for passive and active instruments. The Radial Tonebone Bumper is available soon for $169.99, and runs from any standard 9V power supply.